Before I arrived in Copacabana, I had a very distinct picture of it in my head: vast blue ocean, white beach, brightly coloured umbrellas, and hundreds of extremely tanned people lounging on the sand. 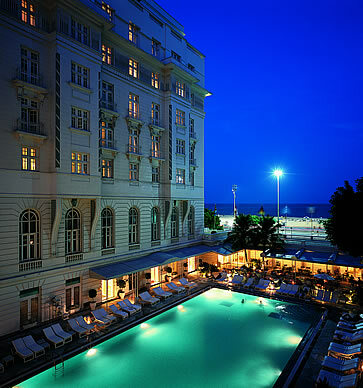 I also had a picture of my ideal hotel: glamorous, elegant, stately; with comfortable white loungers around a sparkling blue pool, waiters on hand to deliver beautiful cocktails, and an air of sumptuousness about the place. Spotting a movie star in the vicinity would not be surprising. 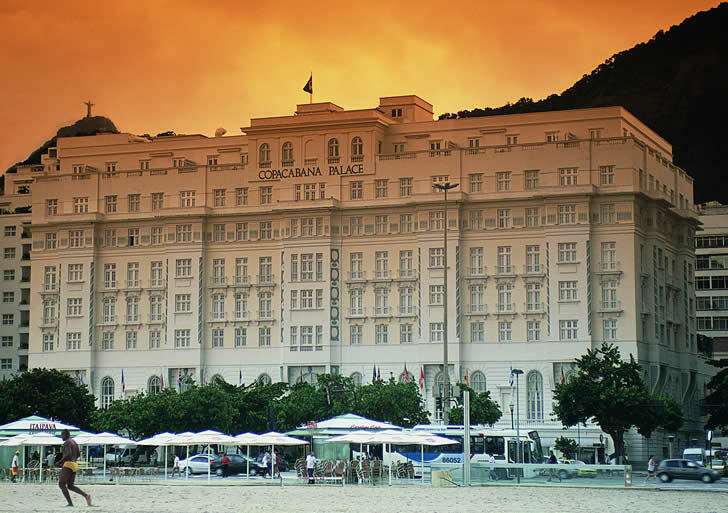 Copacabana Palace was all this, and more. 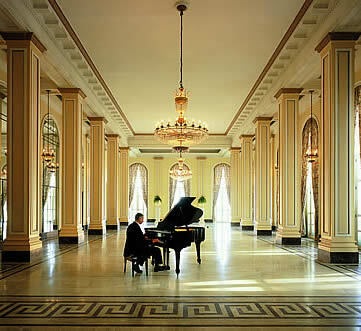 The hotel has been in operation since 1923, and although there have been many renovations since then, you can tell as soon as you step into the lobby that this is a grand dame of hospitality. The chandeliers, dotted throughout the hotel�s many ballrooms, function areas, lounges and restaurants, are original; the d�cor, while extremely comfortable, is classic and timeless, trimmed with gold and marble, exotic murals (all hand-painted by French artist Dominique Jardy); and the high ceilings and large interior spaces speak to a time when space was not an issue. Add in the stunning views of Copacabana Beach and the ocean at every turn, and you can see that this is one hotel whose very essence is steeped in style. This could also be because it has been home to so many chic celebrities, kings, queens, presidents and musicians over the years. A wall of sepia-toned, signed photographs of famous guests combines such figures as Princess Di, Liza Monelli, Brigitte Bardot, Richard Gere, Mick Jagger and Orson Welles. And it shows: each guest is treated with the utmost respect and deference, each guest could well be royalty. The rooms and suites only serve to heighten this feeling. Tastefully furnished, spacious and equipped with every modern convenience you could wish for, you�ll soon feel right at home in the decadent rooms of your suite. Breakfast is served in the P�rgula Restaurant on the edge of the pool, and is an extraordinary spread of every exotic fruit you could think of, an array of fresh breads and pastries, and meats, cheeses and traditional hot breakfasts to suit every palate. After breakfast, spend a few hours lounging by the pool until you�ve worked up enough of an appetite to appreciate the fine Italian cuisine of Cipriani Restaurant. Old fashioned easy-listening classics ease you into an elegant enclave of silver, white linen and fresh flowers. Take a table looking out over the bright blue swimming pool lined with happy guests on loungers, and you can spend the next three hours people-watching as you taste some of the most superb Italian food to be found in Rio de Janeiro, cooked up by native Italian Nicola Finamore. Start the meal off with a Bellini, the refreshingly fruity signature drink of Cipriani (a swirl of peach juice and champagne), and a basket of delicious fresh rolls and breads. Then let the feast begin! An appetizer of fresh tuna carpaccio with aragula, sundried tomatoes and capers, followed by giant grilled shrimp on a bed of brown beans, and a decadently creamy green tagliarini pasta dish, with ham, white sauce and parmesan. Superbly creamy, but somehow not at all rich. A lunchtime feast is a Brazilian tradition, and somehow locals can head straight back to work after the indulgence. But if you need some time to relax after so much eating, head for the Copacabana Palace Spa, where a range of over 25 treatments � massage and facial � will have you feeling refreshed and revitalized, and utterly relaxed. Then there�s just time for one more Rio tradition � dancing! � before the night draws to a close. The Bar do Copa, adjacent to the swimming pool, is Rio�s latest hotspot: a bar during the week, a nightclub on weekends, and will have you dancing to Brazilian beats until the early hours of the morning. What more could you ask for from a hotel in Rio? The beach, the glamour, the food and drink, the dancing� It�s everything a dream of Rio should be, and so much more. Style Mediterranean-style architecture meets classically elegant interiors. Spacious, light, and decadently luxurious. Setting Ideally located in Copacabana, in the heart of Rio de Janeiro, right across the street from the famous stretch of beach. An easy half-hour from the international airport and a few minutes away from the bustling hub of downtown. Why you'll love it It is effortlessly romantic and glamorous, and you�ll feel as if you�ve stepped into a film set in the heart of Rio. 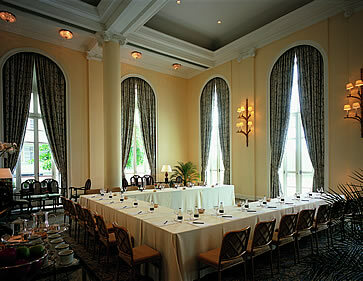 Guests are treated like royalty, and the hotel runs so seamlessly as to appear effortless. Good to know Free high-speed wireless internet is available in all the rooms. A beach service on Copacabana Beach (across the road from the hotel) offers security, loungers, umbrellas and ice-cold water, so that even a trip to the beach is an exercise in comfort. Wow factor Location, location, location � it�s simply unbeatable. 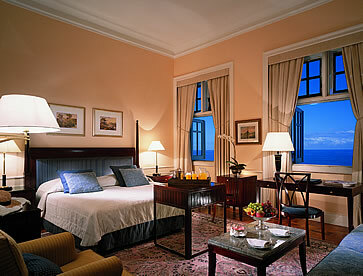 Views out over Copacabana Beach combine with the buzzing atmosphere of the area to make this a glamour hotspot. Best rooms or suites to book The seven luxurious Penthouse Suites on the sixth floor of the main building are simply decadent. All marble bathrooms with two vanities, large bath and oversized shower, more than 100 square metres of space, a large living room and giant balcony looking out over the ocean (and the mountains) make these suites absolute winners. The Pool Ocean View Suites in the Tower Wing Building are also simply superb, with a separate living room and a balcony looking out over the pool and Copacabana Beach. Room for improvement The turn-down service is only at 10pm at night � ideal for those soaking up Rio�s nightlife, not so ideal for those recovering from jetlag. Perhaps guests could be asked on check-in what time they would like the turn-down service to be. Rates Penthouse Ocean View Suite, US$2445. Penthouse City View Suite, US$1995. Pool Ocean View Suite, US$1025. City View and Beach View Suites from US$870. Address Av. Atlantica, 1702, Copacabana, 22021-001, Rio de Janeiro, Brazil. How to Get There Fly into Rio de Janeiro International Airport. From there the Copacabana Palace Airport Service can pick you up, or catch a metered taxi (roughly US$30). Travel Services The concierge service is superb � ask them anything about Rio de Janeiro, travelling in Brazil, shopping or sightseeing and they�ll supply you with maps, information and advice. 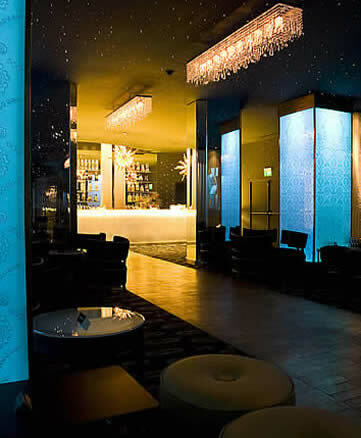 Two concierges are on hand to help you any time of the day or night. Hi, I am travelling to Brazil next month. Do you have any suites available in the last week.